Natural habitat of the plant includes African tropical rainforests. It mainly grows along the Western coast of the continent, from Sierra Leone in the North to Angola in the South. All Anubias species are typically coastal plants. They grow along shores of rivers and streams, in bogs, at that the plant can be completely submerged. However, more often Anubias leaves grow above water like those of most of coastal plants. Due to such a flexibility Anubias species can develop successfully not only in a paludarium, but in aquariums as well. It is true, that Anubias species grown for sale as a rule are kept in a paludaruim conditions. The thing is that they grow a bit faster when growing emersed, their leaves grow larger, the plants bloom more often and as a result you get a chance to obtain their seeds. Another important advantage is that algae fouling is absent in this case. These are plurannual plants with low growth pace. They have a thick trailing rootstalk (called rhizome). The leaves grow upwards from rhizome and the roots – downwards, correspondingly. Root system of Anubias species is built so, that thin roots always take rhizome up above the substrate, which looks like if the plant was standing on some curved legs. This is rhizome, that is often mistaken for a trailing stem, which Anubias uses to stick to the substrate. There is a growing point at the end of rhizome, where new leaves of the plant appear. It gets a bit elongated with each new leaf and in time it can become several dozens of centimeters long. 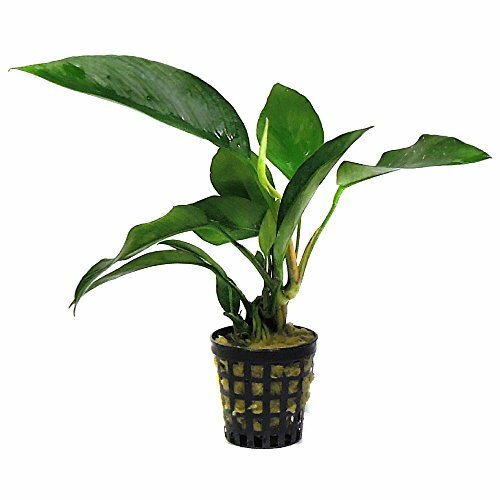 When planting Anubias it is not recommended to bury its rootstalk into the substrate, it’s better to put it above the latter or to fixate it somehow to snags or other tank decorations. If when planting Anubias species you bury it too deep, it may start to rot. The rootstalk should be above the substrate surface, just the roots growing from it should be buried a bit. Leaves of the plant are coarse and leathery, that’s why Anubias species are good for tanks with large cichlids (like a flowerhorn) and herbivorous fish species. Despite relatively small number of species, Anubias impress with their diversity; partially due to the fact, that recently a lot of hybrids of the plant have appeared. The plants are good looking, exotic, but they aren’t classified. Because of this there is a classification mess both on the market and in amateur aquariums. One and the same plant is sold labeled with different names. 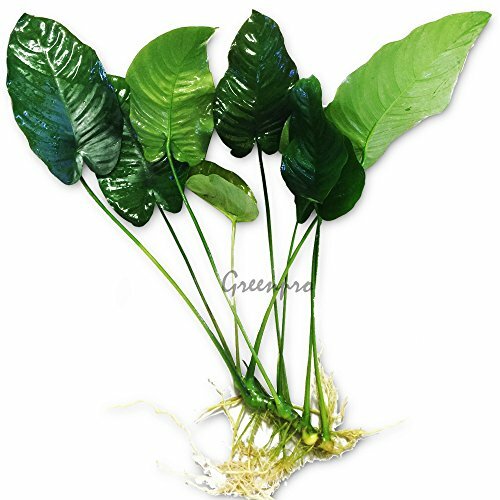 Lamina of various Anubias species may vary essentially and have different shapes: leaves can be round-, heart-, halberd-, oval- and arrow shaped or almost triangular and elongated to some extent. 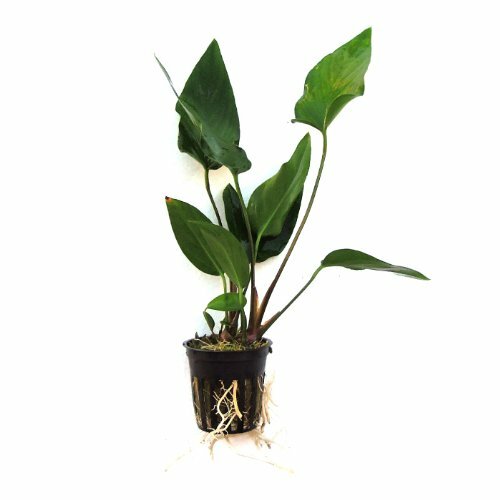 Anubias plants are suitable for paludariums and greenhouses at high humidity and there they grow better than in aquariums. Moreover, this is paludarium where the plants grow to reach their maximal size, they bloom and don’t suffer from algae fouling. Besides, some species require regular period of rest after growing in their submerged form. Anubias has small hermaphrodite flowers, their coloring varies from pale rose to chestnut, they are gathered in a thick spadix inside enveloped, usually pale green spathe. The plants usually bloom when they are out of water, but some of them can do it under water as well. Anubias species can be considered as one of the most undemanding tank plants. They perfectly strike roots both in a substrate of a newly run tank poor with nutrients and in the old one with lots of nutrients. Together with cryptocorynes, these plants can survive even in neglected souring substrate, where other plants usually die. On the other hand, Anubias species have exclusive ornamental properties and diversity of kinds. You can decorate a tank with them by not only planting into the substrate, but attaching them to snags and stones as well. Due to relatively slow growth rate, Anubias bush can maintain its shape for several years, while its unpretentiousness to growing conditions and resistance to various illnesses allow to decrease the amount of time and efforts to take care about it. Despite its ornamental features and simplicity in keeping, Anubias species haven’t become quite popular in amateurs tanks. There are several reasons which explain this phenomena. Firstly, due to slow vegetative propagation, it is almost unreal to get a large number of plants simultaneously. Secondly, despite the fact, that in tanks Anubias species have been cultivated for quite a while, information about them is yet rather insufficient for now. Anubias is a thermophyte, optimal temperature to keep the plant successfully varies from 24 to 28°С. During the plant rest period the temperature can decrease up to 18-20°С. Anubias species can stand even lower temperature for some short period of time. When keeping in cold water for a long time, the plant sheds off its leaves. As for the lighting, the plant prefers dim light. Provided with excessive illumination slow growing Anubias species don’t have time to absorb it during their photosynthesis cycle and as a result various algae starts to grow on their leaves. It’s better to create scattered lighting for the plant. You can do it, for example, by creating shadow in a tank with fluctuant plants on the water surface. Light day duration for the plant should be 11-12 hours. Anubias grows well in clean transparent water with total hardness from 6 to 40° and рН 6,0—7,5. For these plants it is important to keep the tank clean and renew its water regularly. Since when excessive amount of organics accumulates, algae fouling starts to appear on the plant leaves and Anubias is very sensitive in this respect. At such conditions its old leaves die very quickly and only 2-3 young leaves may remain on the plant as well as it may die later. Substrate used for Anubias should be nutritious enough, since roots of some species penetrate quite deep into it. The substrate has to contain sufficient amount of nutrients. When growing the plant in paludarium a mixture of sand, clay, peat and humus will do. If you constantly cultivate Anubias species under water, representatives of some species start to undergo slow degradation: their leaves get smaller, growth rate gets lower or they stop growing at all. Because of this the old leaves get covered with algae and rot off very quickly. To avoid such a problem you should periodically put the plants (for several months) into paludarium conditions, where they will stay at semi-emersed state or without any water at all provided with high air humidity. Anubias species propagate both using seeds and vegetative reproduction. But in a tank they are cultivated by dividing their rootsralk into parts. Unlike seed propagation, vegetative reproduction is more reliable. During the latter, offshoots or end part of the rootstalk with 3-4 leaves and several roots are separated from the parent plant and planted in a new place. When putting Anubias into a new substrate it is recommended to place some fertilizers under its roots. In 1-2 months a new bud appears where the plant rootstalk was cut. Such buds may also form along the rootstalk and this makes the plant branchy. You may observe Anubias blooming not only when it is out of water, in a paludarium or a greenhouse, but in an aquarium as well, since provided with proper growing conditions the plant is capable of blooming under water. This Anubias species has high ornamental properties, but at the same time it needs care and keeping conditions very different from those required by others. It has a shortened rootstalk, that’s why the plant appearance more resembles cryptocorynes and Echinodorus. Its leaves are lanceolate, sharpened and elongated. The rootstalk of the plant develops under ground, so the plant should be buried deep enough when being planted. 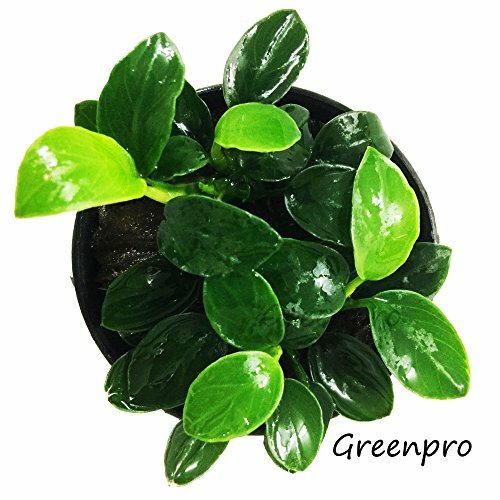 It has low growth pace, usually not more than 1-2 new leaves appear in a month. Scattered light is required to make sure that the plant leaves won’t get covered with algae. Proper filtration and regular water renew are good for the plant, otherwise you may observe Anubias shedding off its old leaves. 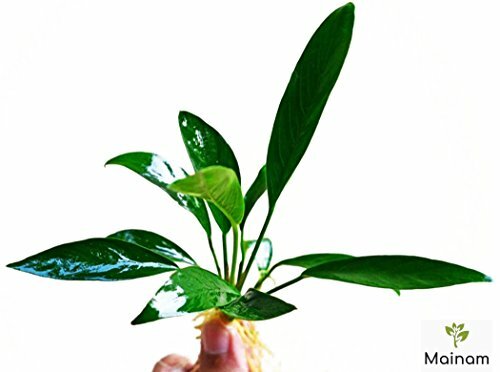 It is desirable to provide the plant with a silted substrate. Optimal tank water temperature is 25-29°С. Once a year or 1.5 years it is good to give the plant some rest by replanting it and putting for several months from a tank to a humid greenhouse or paludarium, where the plant feels much better and grows faster as well. It is better to cultivate this Anubias species in a greenhouse as well. First the plant shoots are grown out of water and only when they have 5-6 well developed leaves they are planted into a tank. A. afzelii care requires some specific skills and experience from the aquarist, that’s why for beginners it is better to choose some other Anubias species. anubias Afzelii Plant color, size, and shape may vary significantly depending on how the plant has been grown. This is one of the most popular Anubias kinds, which is easy to explain: almost all kinds of Anubias barteri don’t require any period of rest in a greenhouse and they can grow under water as long as it is possible without undergoing degradation or loosing their attractiveness. This species is distinguished by its variability and in tanks quite often you may see Anubias barteri v.nana – its most unpretentiousness and small leaved kind. Classical Anubias barteri is rather large sized species, which grows up to 30 cm tall and at that its lamina diameter is up to 10 cm. These characteristics make the plant perfect for large tanks, especially with fishes that don’t get on well with most of aquarium plants. All varieties of the plant prefer tropical tanks with water temperature about 24-26°С. Water hardness and acidity aren’t crucial for the plant. You can grow it both in a substrate and on snags. 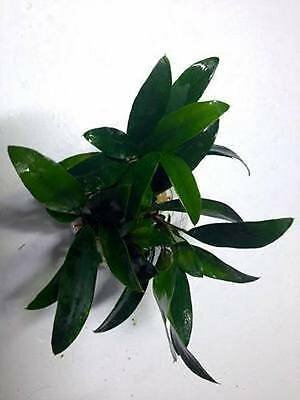 LIVE AQUARIUM PLANTS: Anubias Barteri Round Leaf 1 Rhizome Perfect for any aquarium tank. Difficulty - Easy ready to grow! | Light - Low to Moderate | Growth - Slow. Anubias barteri “Coffeefolia” got its name due to the unusual shape of its leaves, which resembles that of a coffee tree. The plant leaves are a bit wavy, more coarse, than that of the basic plant kind and they grow on a short reddish footstalks. The plant grows a bit slower of nominative A. barteri, it is more prone to algae fouling appearance and unlike the latter it requires several moths of rest in a warm greenhouse once in a year or two. You get 1 potted Anubia Coffeefolia. As you may guess from the name, this species has a large size. This is the largest Anubias you may encounter in amateurs tanks. It forms a huge bush, where you can count up to 30 leaves about 80-100 cm tall. To keep such an Anubias you will need a tank not less than half of a ton capacity. It grows the same slowly as other representatives of the kind: about 2-4 new leaves appear in a year. Emerged form of the plant, grown in paludarium poorly adapts to abrupt complete submerging, that’s why it requires gradual transformation from its emersed form to submerged one. When planting this Anubias species its rootstalk should remain above the substrate surface. It is put into the substrate so, that the trailing rootstalk remains several centimeters above the substrate and only its roots growing downwards are inside the substrate. The plant is cultivated by dividing its rootstalk into parts. This Anubias kind prefers water with low content of organics and minimal amount of suspended matter. It is better to think in advance where to put the plant, since replanting may have negative impact on it. Provided with proper conditions it can bloom by shooting a long, about 50 cm flower-bearing stem. MEDIUM to LARGE SIZE OF AQUARIUM: Leaf size is larger than other Anubias species and also stalks could be longer too. Anubias hastifolia is one of the largest aquarium Anubias species. Its leaves may grow up to 40 cm long and even more. The plant is enduring and relatively undemanding. It requires regular iron containing fertilization to ensure its optimal growth rate. It can’t stand bright light, therefore it requires some shadowed areas to grow. It is better to plant it in shadow to limit growth of algae fouling on its leaves. This is an enduring plant, though it finds it hard to adapt to submerged way of growing in a tank and it grows very slowly under water. However, it is worth recommending for aquarists to grow it in large paludariums. The plant has very coarse leaves and most of herbivorous fishes don’t eat them, that’s why it can be a good choice for a tank with African cichlids or goldfish species. Preferable temperature for the plant is 22 – 28 °С; рН 6,0 – 7,5; dH 2 – 15°. This Anubias species was received artificially. This is a hybrid obtained from intersection of Anubias barteri var. nana and Anubias gilletii. The breed got its name from combination of two words “nana” and “gi”. You can’t encounter this kind in the wild. However, it is also difficult to find it in amateurs tanks as well, while professional aquascapers often use it in their designs. You can encounter this species especially often in nano tanks. To keep Anubias «Nangi» water of any hardness with temperature 22-28°С will do. The plant uses vegetative reproduction: you divide its rootstalk into parts. In tanks it is usually put in the foreground. 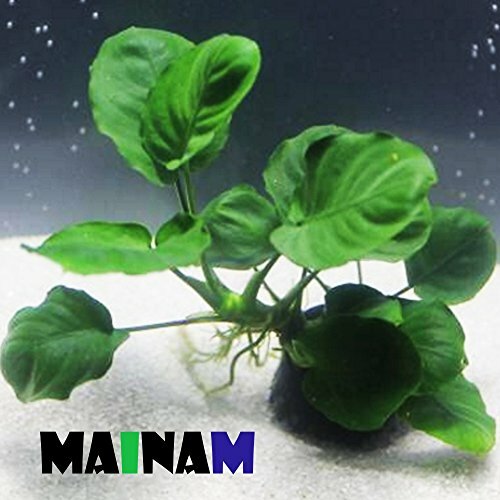 We devoted a separate article to Anubias nana and we shall write about its form anubias nana petite here. This is a mutation appeared in Singapore as a result of selection. It grows very slowly, sometimes it is rather challenging to obtain stable growth rate of the plant. It demonstrates the best appearance when attached to a snag or stone. In tanks it forms short thick vegetation and that’s why it is usually put in the foreground of a tank. The plant shows its best ornamental properties when put on stones or snags. Its dark green leaves can serve as a decoration for any tank. The plant is perfect for making miniature aquascapes in small tanks. Planting this Anubias species into a substrate is prohibited. You should make sure that its rootstalk is above the substrate, otherwise the root system rotting off is inevitable. It is better to fixate the bush on some snag by means of a thread. Later, when the plant roots wind around the snag, you can remove the thread. You may leave Anubias nana petite on the substrate leaving its rootstalk above it and just bury a little its rootshoots. As a rule, the plant doesn’t require additional fertilization, naturally silted substrate is enough for it. Later, the developing root system will lift the whole plant up a bit and its base consisting of tangled roots will be a perfect shelter for small fishes. Ornamental properties of this species in a tank are intensified by the variety of its leaves coloring: you can see almost all tints of green – from light lettuce green to saturated dark green color. Length of its leaves in a tank doesn’t exceed 30 cm. This Anubias kind is a widespreadone among aquarists. It is grown both in a tank and in paludarium, but under water the plant grows very slowly. Its bushes are usually about 50 cm tall and they are put in the background. This plant grows uniformly all the year round. It is not demanding in terms of keeping and growing conditions. Regular rest period in a paludarium isn’t a must for this Anubias species, but if its leaves have become yellowish and covered with algae, yet it’s better to put it into a paludarium. However, if water in your tank is properly filtrated and you perform regular renew of 20% of total water amount, as a rule, the above mentioned is not necessary. 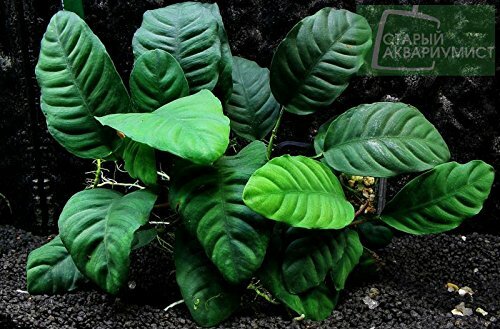 LIVE AQUARIUM PLANTS: ANUBIAS BARTERI VAR. Lanceolata 1 Rhizome Perfect for any aquarium tank.